NSW baseball charter Hills has booked their ticket to the Junior League World Series after battling cross town rivals Ryde in the national championship-deciding game. Sixteen baseball charters played against each other for close to a week in a bid to claim the 2017 Australian Junior League Championship title and move to the next stage – the World Series. NSW’s results in the championship was nothing short of outstanding with three of its teams – Hills, Ryde and Cronulla, all from the Sydney area – finishing first, second and third respectively to take home gold, silver and bronze. It came down to Hills, based in Baulkham Hills, and the Ryde Hawks in the gold medal game on the last day on the national championship. Ultimately it was Hills that won, 7-1. Hills team manager Les Stockdale praised Ryde, but said his team “deserved it”. “You come in with a lot of expectation and the boys really stood up to it,” Stockdale said in an interview with Baseball Australia. “Ryde did a great job. This will be the second year Stockdale heads to a World Series with Hills after the history-making team won their way to the Little League World Series in 2016. Hills was the team to look out for at this year’s tournament thanks to its strong roster. The side had one of the strongest bullpens throughout the entire tournament with stellar pitching from Lianna Davidson (the Australian Youth Women’s Golden Arm winner), Liam McCallum, Soloman Maguire, Alex Ranieri and Clayton Campbell. The offensive line-up backed the defensive up perfectly. Soloman Maguire put in a complete performance against Swan Hills Aces (Western Australia) finishing the game with two triples, a home run and two RBIs. Brock Tonna had a strong performance against Gold Coast Mariners by driving five of the 10 runs for the game. Campbell threw the first no-hitter in Australian Junior League Championship history to lead the team to a 9-0 win over Southern Mariners (Victoria) in the later part of the tournament. Hills went through the entire tournament undefeated. In the gold medal game, Liam McCallum tossed five dazzling innings, keeping the Hawks hitters off balance all night. The lefty finished with three strikeouts and no hits across five innings. When asked about the experience, McCallum said he was excited to get stuck into the best in the world. “I couldn’t think of anything better,” he said. The Australian Junior League Championship was played at Adelaide Shores Baseball Complex between May 21 and 26. Sixteen of the best charter teams from across Australia, made up of the best players from their local associations, took part in this year’s junior championship. In total, 24 games were played. In winning the championship, Hills will represent Australia at the Junior League World Series, which will take place between August 13 and 20 in Michigan, US. Perth Metro Central from Western Australia took out the Australian Junior League Championship in 2015. Cronulla defeated Ryde to claim the championship in 2016 and become the first Australian team to represent at the Junior League World Series. The next event on the baseball calendar is the Australian Little League Championship, considered the “jewel in the crown”. The championship will be held in Lismore, NSW between June 7 and 12. Twenty of the best Little League charters from around the nation will vie for the championship and a place at the coveted Little League World Series in August. Teams from all across the world travel to Pennsylvania, US to participate in World Series, which is the biggest underage baseball event on the planet. Games from the Little League World Series are broadcast on ESPN in Australia. More than 300,000 people attend the 10-day tournament, which this year takes place between August 17 and 27. 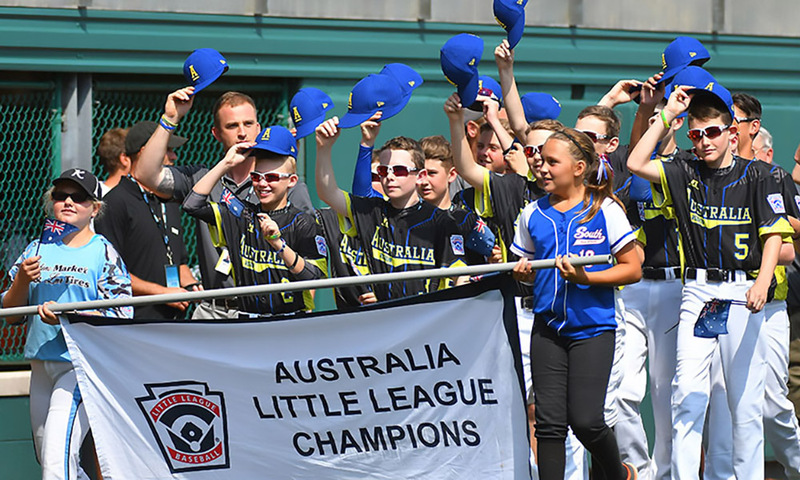 Hills is the defending Australian champion, and will look to be the first team to represent the nation at consecutive Little League World Series’. Hills became the most successful Australian team at a Little League World Series in 2016, winning two pool games and finishing inside the top four international teams, something no other Australian team has done before.